Crispy on the outside and soft on the inside. I don’t even need any chutney or dip for medu vada. For the longest time I used to make these round like little balls because that hole was difficult to make. However less water I used to blend the urad dal, it would be excess and round vadas would be the only option. Then later I learnt the right way from my mom, still I failed! She is an Uzhinnu vada/Medu vada Ninja!! Almost famous for this talent and I did not inherit it😠 Perfected only after some real effort! At the blending step which is the single most important part of this whole recipe. Very consciously I started using less water and blending well. Making Medu vada with the hole suddenly became simple. I have added the video of shaping the vada below. I use rice flour to thicken the batter. And for crispness on the outside. I do not use onions in Medu vadas, not fond of the taste of burnt (after frying) onions in these vadas, on the contrary love that flavour in Dal vada/Masala vada/Prippu vada! Weird me! Not used to the bite of pepper in Medu vada either since I grew up in Mumbai. Was introduced to pepper in these only in Bangalore. I don’t whisk the batter vigorously, just mix well. Have seen videos that say whisk and drop a portion of batter in water, it must float. If you blend the batter well and for long, it must float in water right away. Soak Urad dal for 4-5 hours and blend with little water. Batter must be smooth. 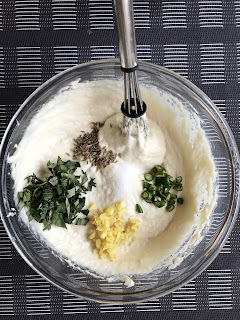 Some blenders/mixies may not do a good job with minimum water, then the only way is to blend smooth with water and then add more rice flour or All purpose flour to the batter. Finely chop curry leaves, chillies, ginger. Add these and salt and cumin seeds (optional) to the batter. It is better not the rest the batter after adding salt since it will release water. Dip your fingers in water and take a portion of batter, also dip in water - the finger with which you will dig the hole in the vada! Drop in hot oil and fry both sides until brown. Serve these Medu vadas as is or with chutney or sambhar. Too tasty to stop at one and even at 5 and 6 and 7 and so on.